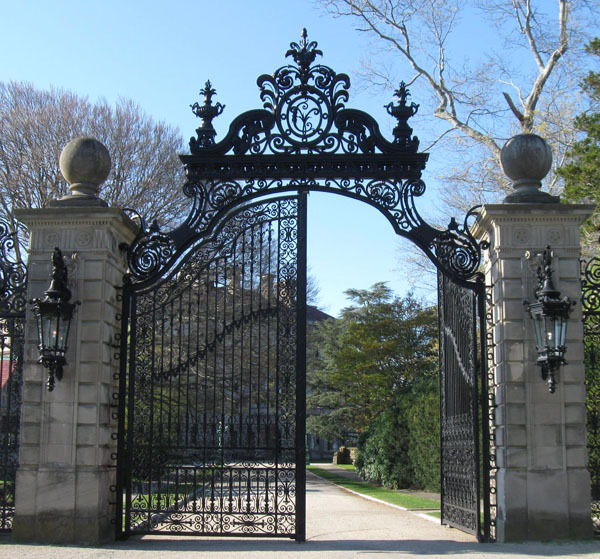 Restored and recently reinstalled, magnificent wrought-iron gates mark the northern entry to The Breakers, in Newport, Rhode Island. On a recent Friday evening, as the sun was casting an orange glow over the ocean waters a few feet away, two tradesmen, working from a cherry picker and their Lodi Welding pickup truck, hoisted a large, intricately crafted piece of wrought iron into place. The piece dangled in mid-air, then settled into place. The men sighed, and then one said with a grin, “We’ve been working on these for two years.” And, at last, the splendid gates are back. Renaissance-meets-Gilded-Age-industrialist grandeur. Wrought-iron scrolls meet beneath a wrought-iron arch whose swirls of urns and acanthus vines reach their zenith in a crested oval containing the initials CV, rendered with calligraphic aplomb. The northern gates are one of several sets that guard The Breakers, and all had suffered from years of exposure in the marine environment when, in 2009, The Preservation Society of Newport County (newportmansions.org) — owner of The Breakers — enlisted master metal workers from Lodi Welding of Hackettstown, NJ, to repair and restore the gates. Grants from the Alletta Morris McBean Charitable Trust and the Loebs Family Foundation have supported the project. All gates bear a similar design. The front entry gates along Ochre Point Avenue were restored first, removed in April 2009 and reinstalled in late 2009. Next, the north entry gates along Shepard Avenue were removed in mid-2010, and have just now been reinstalled. Two final sets marking the property’s northeast and southeast corners along the Oceanside path known as Cliff Walk are currently being restored. Bringing the gates back to their glory was a demanding task. They had to be dismantled and the wrought-iron pieces sandblasted to remove paint and rust, then every piece was repaired, galvanized in liquid zinc, and re-painted. Fantastic!